Oak Alley tour plus a 16 passenger air-boat swamp tour. We are only 35 minutes from New Orleans, yet a world apart. Our New Orleans air-boat tour is a high speed adventure that is part tour, part thrill ride. You will travel at high speeds in the 16 passenger boat, then slow down and stop for photo opportunities. Along the way, you will get a personal tour by your local Captain. Our air-boats have stadium seating, so that the person in front of you does not obstruct your view, and every seat is great for experiencing the tour and viewing the wildlife. Yes, gators will get close, very close. So close, that you will be able to look into those reptilian eyes. 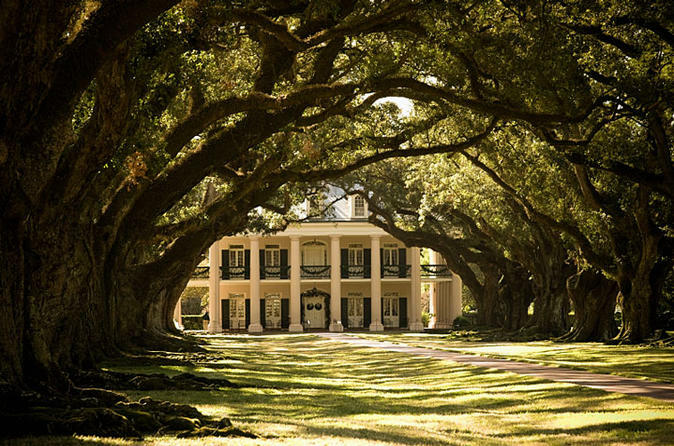 Oak Alley Plantation was built in 1837, with a 1/4 mile path, from River Road to the plantation house, lined with twenty-eight evenly spaced Oaks. There are additional attractions on the grounds which includes a restaurant, cafe and gift shop. The choice is yours how you would like to use your free hour.